The 15 Best Rainy Day Activities to Do in Arizona! Arizona and rain don’t exactly mix, especially given we only average about 36 days of precipitation and eight inches of rain per year, according to U.S. Climate Data. But when the rain does come to Arizona, how are we expected to spend our day? We’re here to help you map out a plan. Check out these 15 great rainy day activities to do in the Grand Canyon State. Have you ever sat on a bed of nails? Felt the affects of a hurricane? Examined an animal brain up close? Experience this and more at the Arizona Science Center. This downtown Phoenix museum provides 164,000 square-feet of exhibits where you can partake in interactive learning. Visitors have the chance to check out a rotating list of exhibits dedicated to all things science. Popular mainstays include the Dorrance Planetarium and the Immersion Theater—where visitors are transported into the outer echelon of the universe and into the thick of a natural disaster. Tempe’s Climbmax is Arizona’s largest rock gym and a great place to get exercise without having to step foot outside. This two-story gym includes multiple archways, a 45-degree wall, and over 180 different rope routes. Climbmax has a little something for climbers of all skill levels including bouldering, top rope, lead climbing and crack climbing. Don’t let a little rain spoil your golf game. Instead, head to Top Golf for fun at the driving range. Top Golf is a giant driving range and entertainment complex. The micro-chipped balls track which target you hit and you get designated points based on how close your ball gets to the bull’s-eye. Scottsdale’s location has over 200 climate-controlled bays in addition to a full-service bar and restaurant, video games, and rooftop fire pit. Skydiving isn’t just for the heroically bold. At iFly Indoor Skydiving, you can experience the thrill of flight from the confines of a vertical wind tunnel. The tunnel simulates the feeling of skydiving in a cushioned flight chamber. You’ll be able to gear up, take flight training, and head to the flight chamber for an extended float in the air. The iFly experience will blow you away. OdySea is an impressive aquarium—especially when you consider the fact that it’s surrounded by thousands of miles of landlocked desert. OdySea houses over 30,000 animals, 500 species, and 50 exhibits in a state-of-the-art facility. 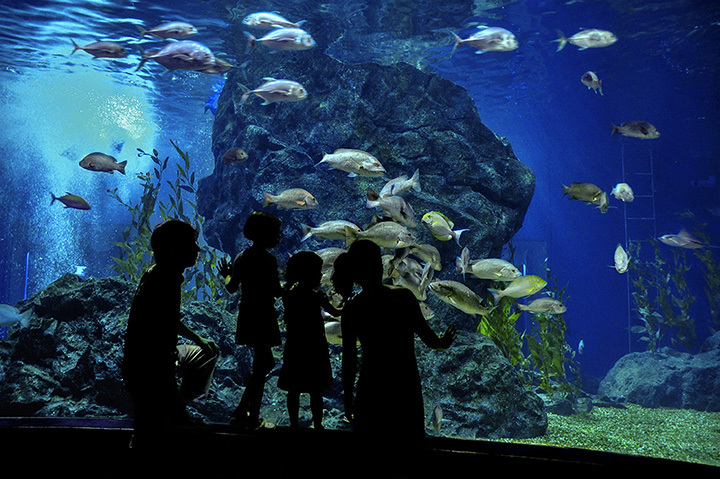 You can also learn about the wonders of marine life in their 3D theater, educational presentations, or their SeaTrek—an underwater ocean walk. Music fans from around the world will appreciate the Musical Instrument Museum. The MIM is comprised of galleries dedicated to the instruments, artists, and cultures that have left their footprint on music. The Artist Gallery includes instruments played by legendary musicians like Elvis Presley, John Lennon, and Taylor Swift. You’ll also be able to rock out in the Experience Gallery where you can touch, play, and hear an array of instruments from around the world. People are drawn to movies on rainy days like moths to a flame. There are few theaters, however, that offer a movie going experience quite like The Loft Cinema. This nonprofit cinema regularly holds screenings with local filmmakers and also plays independent, foreign, and classic art films. Whether you’re attending a special screening or checking out the latest indie film, this theater is a perfect place to escape the rain. Escape the Room transports you into a mystery filled challenge. During this adventure game, you’ll be given a series of clues and puzzles in order to make your way out of a locked room. You and your group will have 60 minutes to make your escape in themed rooms ranging from an apartment, 80s room, and western bank heist. If you’re fortunate enough to complete the challenge, you’ll be photographed and win some serious bragging rights. Bowling is usually equated with the Dude from “Big Lebowski” or Homer Simpson. So, upscale bowling may seem like an oxymoron. Not so. Lucky Strike is a bowling alley in a sophisticated setting. Their amenities include everything from a full bar to live DJ and even bottle service. You can sip on a cocktail, enjoy appetizers, and bowl the night away. Glow Putt Mini Golf is exactly what you’d expect. This 18-hole mini golf course is located inside a glow-in-the dark building. The UV lights illuminate the course and the jungle-safari theme. The golf balls even light up and the course is littered with charging stations to keep your ball lit as you go from hole to hole. This creative twist on mini golf is a favorite amongst families, couples, and parties. We all need a good laugh—especially after a rainy day. Downtown Phoenix’s Stand Up Live dishes out the laughs by hosting some of the biggest names in comedy. In addition to attracting A-List talent, Stand Up Live hosts open mic nights and improv groups. Sedona isn’t all about the outdoors. They also have some of the best wineries in the state. Spend a rainy day with Arizona Winery Tours. You’ll be picked up on a limo bus before traveling to three local Sedona & Oak Creek Canyon wineries. In addition, you’ll have the chance to try samples in luxurious tasting rooms and enjoy a catered lunch. In this humble writer’s opinion – Arizonans don’t know how to drive in the rain. Still, that shouldn’t stop you from hitting the road. K1 Speed in Phoenix is a high-speed racing arena and perfect place for you to showcase your need for speed. The racetrack has European-style karts that fly at nearly 45 miles per hour. Their entertainment center also features fun like pit cafes, pool tables, and authentic racing memorabilia. Hit the ice at Ice Den—the official practice facility for the NHL’s Arizona Coyotes. The 150,000-square foot facility has plenty of room for skaters on a rainy day. They host public skating sessions three times per day in their giant, 150,000-square-foot facility. Additionally, skaters can refresh at the Ice Tavern—a sports bar with a full view of the rink. View more Arizona Rainy Day Activities.